See Home page for more details. Available to ship May 1, 2013. Here is a full and complete revision to the original How to Hotrod Corvair Engines by Bill Fisher. Everything the engine builder needs to know to rebuild the Corvair for power in all applications from street to full race. Covers all Corvair engines from 1960–69. 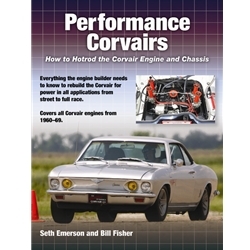 Seth Emerson, successful Corvair racer and technical guru, has rewritten the entire book to current performance standards, adding more than 150 new photos and charts. Bill Fisher was a huge fan of Chevy inline six cylinder engines. Soon after the Corvair came out in an opposed six configuration, he authored the original How to Hotrod Corvair Engines in 1964.